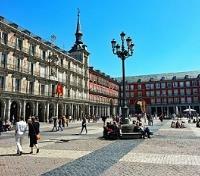 Led by expert private guides, embark on city tours of Barcelona and Madrid. 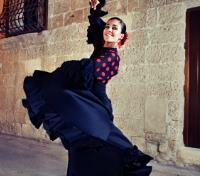 Feast on delicious food as you take in a flamenco show. 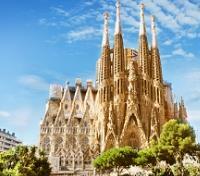 Explore the famous Gaudí architecture of Barcelona. 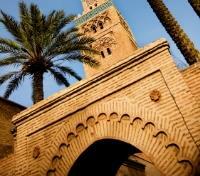 Explore Marrakech’s mosques and palaces with private guide. Discover the glory of Spain, Portugal, and Morocco on this custom voyage featuring architectural gems and art, historic sights, tantalizing cuisine, and maze-like medinas. Explore Barcelona, Madrid, Lisbon, Marrakech, and the High Atlas Mountains on a range of private and shared tours with expert guides. Throughout your journey, relax in a mixture of fine hotels and dazzling riads that offer extraordinary surroundings and exotic charms. Travelers have long been seduced by Morocco’s unique architecture, vivid colors and dizzying labyrinthine medinas. Descend into the beating heart of Morocco, set against the snow-capped High Atlas Mountains. Wander amid the sizzle and smoke of Marrakech’s bustling marketplace and sip traditional mint tea in the courtyard of your tranquil riad. Experience an off-road adventure through the Atlas mountain range to one of the highest perched villages clinging to the mountainside. Explore Berber villages and watch the sun dance across the peaks. These are just a handful of the highlights awaiting you on your glorious adventure. Meet your private guide and depart on foot for a half-day walking tour of Old Barcelona's historic Gothic Quarter. Take a journey back in time, and discover Roman remains and medieval palaces in the heart of the city. You'll stroll past medieval Roman walls and towers dating back to the 4th century, meander through narrow stone alleyways of the old Jewish Quarter, and stand at the center of the governmental square Plaça de Sant Jaume. Walk past the 15th century Casa de l'Ardiaca, former residence of the archdeacon, and enjoy visit of the 13th century Barcelona Cathedral, with its stunning neo-Gothic facade, and delightful stained glass windows. 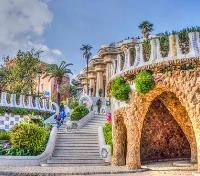 After soaking up Barcelona's historic core, travel like a local as your guide hails a taxi to bring you to famed Spanish architect Antoni Gaudi's iconic Sagrada Familia, where you'll get to visit this UNESCO World Heritage Site, and monumental masterpiece of architecture - still under construction over 100 years after building commenced. One of Barcelona's must-see sites, it's the largest unfinished Roman Catholic church in the entire world, and its unique style is not to be missed. After your visit, you'll have another taxi ride back to your hotel, though you can choose to continue exploring on your own if you wish. Meet your private guide and transportation, and embark on a half-day tour to discover the fascinating world of modernist architect Antoni Gaudí and his extraordinary achievements throughout Barcelona. Learn about Gaudi and his iconic architectural style, whose works have redefined and transformed the landscape of Barcelona, and no less than seven have been listed as World Heritage Sites by UNESCO. Walk along the elegant avenue Paseo de Gracia, one of Barcelona's most important shopping and business areas, where you'll find several of the city's most celebrated pieces of architecture, including two of Gaudi’s houses, which you'll be visiting today: Casa Batlló, and Casa Milà (known as La Pedrera). Casa Batlló is a surprising building with enigmatic forms, a colorful façade, and refined architectural details. La Pedrera is a sculptured residential building, and a fine example of how the wealthy lived at the beginning of the 20th century. Round out your Gaudi experience with a visit to Parc Guell, in upper Barcelona, enjoying beautiful views out over the city. Built at the start of the 1900's, and though never fully completed before his death, it still remains one of Gaudi's most colorful and imaginative works, and one of the most impressive public parks in the world. Depart by train from Barcelona to Madrid. The train ride takes approximately 3 hours. 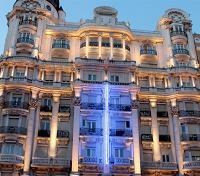 Hotel Atlantico is perfectly located on the buzzing Gran Via, in Madrid's city center, often compared to New York City's Broadway Avenue. Decorated in a neoclassic style with tapestries, furniture, sculptures and period windows, the hotel offers guests modern facilities with all of the amenities one would need for a pleasant stay in the capital. Guest rooms are comfortable and spacious, relaxing with neutral colors, and provide free wifi internet connectivity. Relax in the evening with a cocktail, taking in the spectacular view of the city from the hotel's 9th floor terrace. Departing on foot with a private guide, enjoy a half-day walking tour that will take you through Madrid's oldest quarters, tracing the legacy of the Habsburg and Bourbon dynasties. Admire the many churches, convents, inns, palaces, theaters, narrow medieval streets and traditional shops, all steeped in history that no visitor should miss. Discover the capitol’s key sights like Puerta del Sol, renowned as the bustling heart of Madrid since the 17th century, and Calle Mayor or Plaza Mayor, a porticoed square that will take you back to the times of swashbuckling swordsmen and medieval rogues. Scamper through the Arco and Calle Cuchilleros where you'll find centuries-old taverns dug into caves under the square, and the Plaza de la Villa with excellent examples of Spanish architecture. Marvel at the impressive Royal Palace, the largest in Western Europe, and the elegant Plaza de Oriente, lined by gardens and grand statues of Spain’s early rulers. 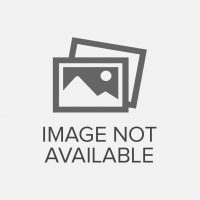 This evening, make your way independently to Corral de La Moreria Flamenco, an authentic tablao (place where flamenco is performed) in the Old Quarter of Madrid. Here you’ll enjoy a three course typical Spanish dinner with wine and mineral water, followed by a stunning performance of flamenco, a traditional Andalusian art form which combines professional singing, guitar, and dancing, for an overall dazzling experience. Flight is required, currently not included in the quote. Please contact your Destination Expert if you are interested in adding this service to the itinerary. A welcome package with a bottle of wine, city map, train tickets (if relevant), and any other touristic information that we deem you may find useful will be waiting for you upon your arrival at your first hotel on your trip. 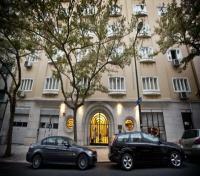 Hotel Britania is a genuine Art Deco Boutique Hotel in the Historic Centre of Lisbon. 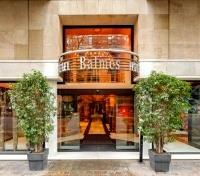 Located on a quiet street right alongside the cosmopolitan Avenida da Liberdade. The only hotel to remain intact until today, this hotel records the glamour of the 1940's. Everything about its design strives to reawaken the spirit of the unit without losing its original soul. The rooms conserve ample dimensions as well as the cork floor. The warm colours contrast with the elegant lines of the furniture and the luster light fittings. The recovery of the whole building is exemplary as is the case of the paintings in the bar alluding to the Portuguese overseas empire. With a private guide and driver, embark on a half-day tour of Lisbon, the city of seven hills, has layers of history dating to occupation by the Phoenicians, the Romans, the Visigoths and the Moors. 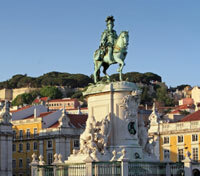 Visit the heart of the city, Rossio Square, then spend some time in Alfama, the Old Quarter. See the Lisbon Cathedral, with history dating back to the 12th century, and admire views of St. George’s Castle, a Moorish fortification, while catching a stunning panorama over the city from the Miradouro da Senhora do Monte lookout. In Belem, the city's monumental district, walk alongside a pair of UNESCO World Heritage Sites: the stunning 16th century Jeronimos Monastery, and the Belem Tower on the bank of the Tagus River. 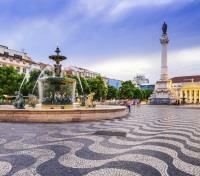 Enjoy a short stop at the Monument to the Discoveries, celebrating the influential 15th-16th century Portuguese Age of Discovery before a transfer back to your hotel. Accompanied by your private guide, depart on a scenic coastal drive, spotting several sandy beaches hidden within the cliffs, protected by the 17th century fortresses along the coast. Arrive to the beautiful resort town of Estoril, famous as the home of the Casino Estoril and Hotel Palácio, known rendezvous points for WWII spies and their handlers, while Portugal remained politically neutral. Take a stroll on the Tamariz Beach promenade, admiring the 17th century Forte da Cruz castle, set behind a backdrop of palm trees. Continue to Cascais, once a small fishing village, the town has managed to maintain its seafaring traditions combined with the aristocratic and royal presences of the late 19th and early 20th century, as it shifted into a luxurious resort town on the Portugal Riviera. Passing through its animated town center you’ll find a cosmopolitan life side by side with stunning Atlantic beaches. 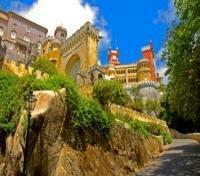 After, head to Sintra, where hundreds of years of history and culture await, surrounded by lush vegetation. After a short walk in the old city center, find yourself surrounded by the old houses that are now converted into small quaint handicraft shops and traditional pastry shops. Ascend the mountain by shuttle for a visit of the 19th century Pena Palace, Sintra's undisputed highlight, a most incredible combination of architectural styles, colors, and shapes, you'll feel like you've entered a fairytale. Conclude your day with a return to Lisbon. Meet your driver for a private airport transfer in Lisbon. Please note drivers may or may not speak English as their sole responsibility is to transfer clients from one location to another. If you would like to have the presence of an English speaking Assistant or Guide for your transfer this can be pre-arranged upon request and would be subject to an additional supplement. Upon arrival into Marrakech, you will be met on the tarmac by a local representative and escorted through Customs and Immigration, avoiding any queues along the way. A local representative will provide you with your travel documents, go over the itinerary in detail and answer any questions you may have about your upcoming adventure. You will be privately transferred between your accommodations and Marrakech airport by a professional driver. Riad Les Yeux Bleus is located in the Bab Doukkala district, one of the most popular and picturesque quarters of the medina, and just ten minutes on foot from the square of Jemaa el Fna in the heart of Marrakech. 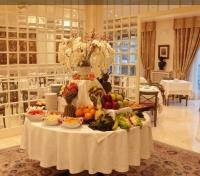 Riad Les Yeux Bleus features comfortable bedrooms, each one decorated in its own style. 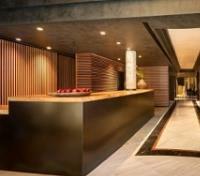 The property features two charming patios; two pools, a library, a hammam, and a magnificent roof terrace with a bar. 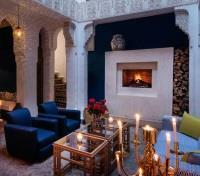 It is the perfect place for you to relax after a hard day of exploring the wonders of Marrakech. 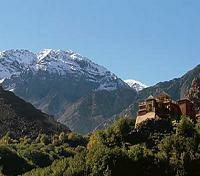 Enjoy a morning excursion to the High Atlas Mountains and Kasbah du Toubkal. Heading south from Marrakech along the hairpin bends, you will eventually reach one of only two passes through the High Atlas Mountains. Perhaps make a brief stop at the Berber villages of Tahanoute or Asni and continue to the village of Imlil, where you will take a ten-minute walk up to Kasbah du Toubkal. Mules will be available if you prefer to ride! Situated on a hilltop with commanding views of the surrounding valley, the Kasbah du Toubkal was built as a summer palace for the Pasha El Glaoui. It is now a wonderful place to experience Berber hospitality and a great base from which to explore the High Atlas. Enjoy a traditional Berber lunch on the terrace overlooking the snow-capped peaks or a picnic lunch on the trail. You may wish to take a stroll to a nearby Berber village, where an invitation to share mint tea with the locals can be arranged. Later in the afternoon, your driver will return you to Marrakech where you will enjoy the remainder of the day at leisure.